Photoshop Elements 13 offers you a much more simplified method for creating dynamic slideshows that you can export to H.264 MP4 files that can be viewed on Windows, Macintosh, iOS, and Android devices. The Slideshow option in the Create panel was previously reserved for Windows. In Elements 13, all the options for creating slideshows are the same for Windows and Mac users. 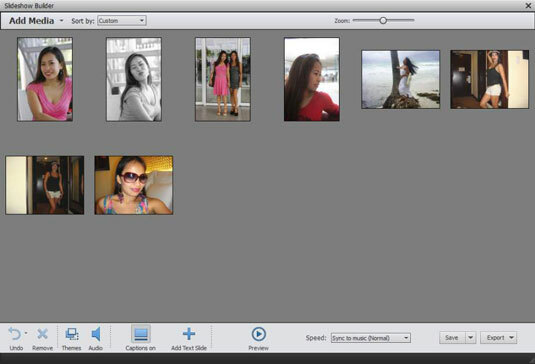 1Select the images you want in the Organizer or Photo Bin, click the Create tab, and then click the Slideshow option. The first thing you see is the Choose a Theme panel in the Slideshow wizard. 2Click the theme you want to use and click Next. The Slideshow Builder appears when you click the Edit button in the Slideshow preview. 3Add or delete media in the Slideshow Builder. Open the Add Media drop down menu and add media from the Organizer or from folders on your hard drive. 4Click Export to export your slideshow. 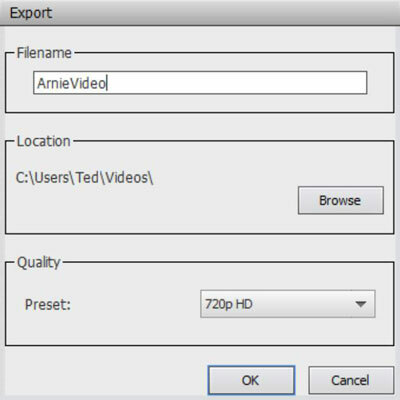 Choose a preset for your export in the Export dialog box. You can choose between 640×480, 720p HD, or 1080p HD. The file is exported as an MP4 file that can be viewed on multiple devices.